Samantha Jacobs, Bee-utiful (detail), 2018; deer hide, blue fox fur, silk velvet, glass beads, caribou fur, sinew. Courtesy of the artist. Photo: Fresh Perspectives, 2018. Greta Mikkelsen, Butterflies and Moths; LEA Tobacco Company silks, 1911–22. Courtesy of the artist. There are many ways to get involved in the Wisconsin Museum of Quilts & Fiber Arts. Become a member of WMQFA and enjoy exciting quilting and fiber art exhibits year round. Plus, take part in educational opportunities and special events. 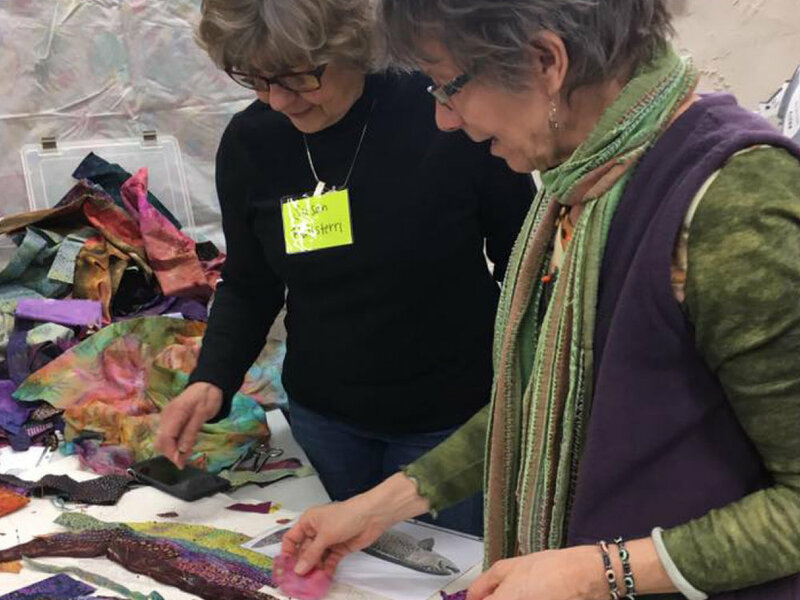 You can also Volunteer with WMQFA and join together with people who share your interests in the fiber arts, and have fun spending time at our idyllic, 1850s farmstead. There are several ways to Donate to WMQFA. We appreciate your support! The Wisconsin Museum of Quilts & Fiber Arts, located just east of historic downtown Cedarburg, Wisconsin, is dedicated to educating the public about the artistic, cultural, historic and social importance of quilts and fiber arts. The museum’s roots extend back to 1988. Since then, the museum has documented over 8,000 quilts. In addition to quilt documentation, the WMQFA collects and displays important historical fiber arts. The Wisconsin Museum of Quilts & Fiber Arts offers lectures and classes for all adults, beginner to advanced. These learning experiences are led by a variety of teachers from all over the world. WMQFA also offers events, workshops, and tours for schools and youth. With over 2,300 square feet of new classrooms and multi-purpose space, we have ample room to serve school groups, youth organizations, and families with programs linked to fiber arts. The Wisconsin Museum of Quilts & Fiber Arts is the only museum devoted to the creation, education and preservation of time-honored fiber arts in Wisconsin. In 2011, we restored our 1850's barn for use as an exhibition gallery, classrooms, collections storage and general purpose. Visit us at one of our upcoming events! Receive updates regarding news and events from WMQFA.